What's Conversational Marketing? How to Apply It in 2019? The ability to personalize interactions with customers is every marketer’s fantasy. In fact, according to Accenture’s Personalization Pulse Report, even customers prefer conversational interaction with brands. Today’s chatbot technology and social media listening have made this fantasy a real possibility. Small businesses and large can now revolutionize their brand experience through conversational marketing, supported by effective content marketing. So, what exactly is conversational marketing? Conversational marketing involves real-time interaction with customers while constantly seeking and responding to feedback. It’s like having genuine, personalized conversations with multiple customers or prospects simultaneously. In the past, such an act would have required massive manpower. With social media listening and chatbots, a single person can efficiently create such an experience. As a marketer, you must consider where your audience is spending most of their time. According to BI Intelligence, messaging apps are now used more than the most popular social networks. Chatbots have better open rates than emails. Further, they can be used to collect subscriptions and distribute content, just as emails can. They’re also easily measurable like emails. Chatbots allow double-sided conversations in real time. Many marketing channels lose out in comparison to chatbots in this regard. Chatbots can be used to increase brand engagement, lead generation and sales when programmed in the right ways. Chatbots can reduce fatigue and increase efficiency in sales calls. They can be programmed to interact with prospect customers up until it’s the right time for direct engagement with a sales executive. Prospect customers are more likely to share through conversations than they are to share through online forms. What is the most important requirement to implement conversational marketing? It’s data. In general, data can provide invaluable insights that make for great marketing decisions. Specifically, data is at the core of conversational marketing. It’s through data that you can analyze the effectiveness of your chatbot dialogues or programming. This analysis is what will help you improve the effectiveness and conversion ability of your conversational marketing activities. How to implement conversational marketing without annoying customers and prospects? Just as every other form of marketing, conversational marketing has to be treated with care. Implementing this marketing tactic without thought can lead to more harm than benefit. For instance, some marketers set chatbots to immediately pop-up on websites asking “How may I help?” How would a website visitor know what to ask before getting enough time to explore the website? This is a common rookie mistake. Think through your chatbot prompts carefully. 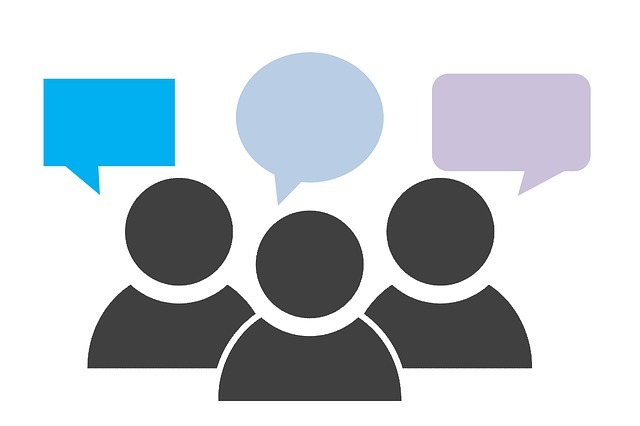 Before we explore conversational marketing further, let’s discuss tips to implement conversational marketing without annoying website visitors (customers). Give website/social media page visitors enough time to explore your display content before engaging them through chatbots. Carefully consider the time/trigger to set-off your chatbots. Listen carefully to what customers want before making any assumptions. Customers’ issues may be different from what initial market research indicates. Customers’ issues and questions could also evolve over time. This is where social media monitoring technologies can make an appearance. Refrain from using chatbots to replicate lifeless, sale-y conversation. Instead of asking “How may I help you?” experiment with “Where do you work?” or “What’s your current biggest hurdle?” This could personalize the conversation more effectively. Ask customers for feedback where possible. Give them options. People deeply appreciate when you ask them how they would prefer to continue their engagement with your brand. For instance, Sujan Patel, and Mailshake used the app’s Resources Page to both give away free resources and gauge website visitors’ interest in products so they can be directed to a sales funnel. The easiest way to create effective marketing plans is by seeing good examples of them in action. Here are a bunch of examples of successful conversational marketing that you could use as inspiration when creating yours. Domino’s has always been invested in the latest technology, giving it an advantage over competitors like Pizza Hut and Papa Johns. 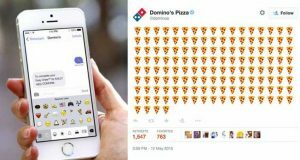 Domino’s CEO J. Patrick Doyle has constantly raised the bar for customer experience by enabling pizza eaters to order from all devices, both wearable and otherwise. While it’s mind-blowing to be able to order through smart watches and your car, it’s even more thrilling to be able to tweet pizza orders. This extent of convenience is only possible because of Domino’s unwavering pro-technology stance. Of late, there has been a lot of innovation driven through Facebook messenger bots. Lyft’s Facebook bot is a classic example of how new technology can revolutionize an existing service. Lyft basically pairs car owners driving in the same direction as people looking for rides. This carpooling app which was already user-friendly became even more so when it enabled ride-matching through Facebook. Any user can hire a ride simply by clicking on the car icon within Facebook Messenger. Facebook’s ad platform and data collection may be under fire, but that has clearly not deterred marketers from investing in Messenger bots. Meal kit providers have become popular in recent times, owing to the growing trend of people with no time to prepare food. HelloFresh is one such company that was founded in 2011 and has since expanded to serve across three continents. It’s no surprise that this massive global player would be interested in exploring messenger bots to elevate the customer experience. Using HelloFresh’ bot who’s named Freddy, customers can explore meal options, ask questions about them and set reminders to place orders. Apps that need to be used on a regular basis required bot-like experiences so they can converse with services without having to wait for on-call assistance. Most of us rely on Facebook for birthday reminders and wishes. That’s what makes 1800-Flowers a remarkable service to have on the social media platform. Using 1800-Flowers’ Facebook Messenger bot, one can explore and order flowers without ever leaving the chat platform or format. Additionally, you can even access customer support from the messaging app should you need to provide specifications. Connecting the right services through Facebook messenger can result in a significant increase in business. Sometimes, incorporation of conversational marketing can result in a substantial increase in revenue. Take the Australian Open for instance. The official Australian Tennis body experimented with Facebook ads and bots to enable easy booking for last-minute ticket buyers. This method increased conversions by 170% and yielded a return on investment of 25X. The assumption that last-minute buyers would pay for convenience paid off for the brand. One of the smartest ways to increase business is by reducing the hurdles between a customer and his or her purchase. Travel planning is an extremely painful process that involves a lot of research. 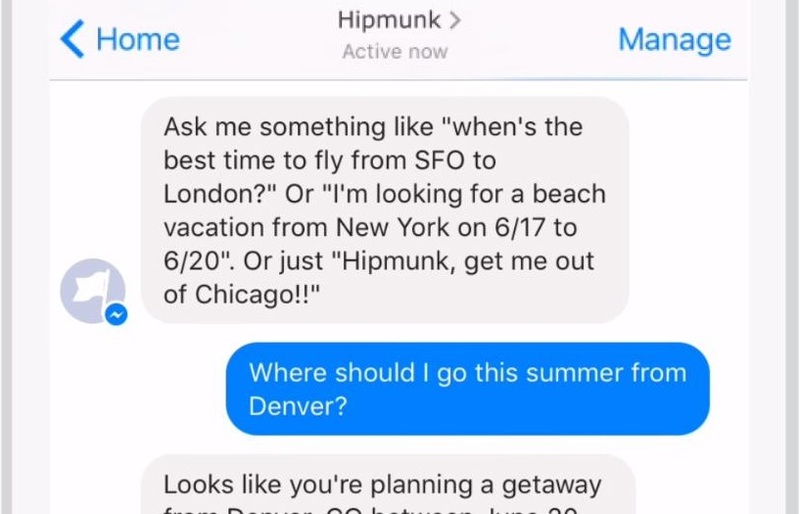 Hipmunk is an app that was built to make the travel-planning process effortless by allowing users to find and book flights, hotels, rental cars, or packages. It’s no surprise that this company decided to explore conversational marketing to make the booking process even more convenient for users. 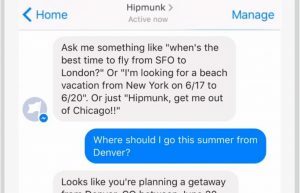 Through personalized, informal language, Hipmunk programmed bots on Facebook, Slack, and Skype to make customers feel more ease-of-use when booking travel experiences. If you’re an adventure-seeker who prefers nature stays that are set well away from the bustle of cities, you can find such vacation stays using Wildr. Some businesses settle for Facebook messenger bots. Other businesses go beyond to revolutionize the customer experience by working with Google and voice commands. eBay has built-out an advanced bot that allows you to connect with Google Home or Google Assistant to explore categories on eBay and make purchases. The bot even searches for the best deals and forwards them to your mobile device for easy access. Verbal conversation is the probably the most advanced and effective way to implement conversational marketing as it’s closest to the human conversation experience. There’s no end to creative ways in which you can program Facebook’s Messenger bot. Take National Geographic’s example for inspiration. To promote their show “Genius” focused on the lives of legends like Picasso and Einstein, NatGeo built a bot that would converse with page visitors in the voice of the geniuses. A page visitor simply had to click on Send Message and they would be connected with Einstein who would share quotes about relativity and other areas of Einstein’s research. Even the simplest of conversational marketing tools can be used to create a massive impact if you find the right customer engagement strategy. Give customers exactly what they desire. For women shoppers, having a less-intrusive personal shopper is probably a dream come true. Surprisingly, Spring’s personal shopper bot wasn’t designed to converse with page visitors. Instead, it was built to share lists of questions and seek feedback until a customer could narrow-down on precisely what she was searching. Sometimes, conversations aren’t necessary. You could program a bot to simplify the shopping experience – reduce the steps between research and purchase. Landing page-creation app LeadPages used the most basic website navigation-assistant bot to increase their conversions. Before programming the bot to display a welcome message, LeadPages had a little over 300 conversations through the bot. Post-implementation of the welcome message, LeadPages had over 1000 conversations. It’s not enough to simply create a bot. It’s also important to measure the effectiveness of your bot dialogues and optimize them for the best impact. Sometimes, customers need prompts to initiate conversations with bots. If you’re using a form to generate leads, you may find better success using bots. Lead generation forms that are static may attract irrelevant leads. RapidMiner used a bot to filter such responses and collect only revenue-generating leads. With massive inbound website traffic, RapidMiner couldn’t engage every website visitor, so they created a bot to automate the lead qualification process by asking intelligent questions and recording the responses. The switch from lead capture forms to conversational marketing bots resulted in a generation of 4000 leads and $1 million in revenue. Personalized conversations can dramatically improve the customer experience for any business. By using the right conversational marketing strategies, you can revolutionize the way your company does business and reinforce your content marketing efforts. So, what are you waiting for? Get started today.